"I'm not really in my comfort zone here." Series creator Andy Breckman is quick to admit that Monk is built on the time proven Sherlock Holmes model, with the unusually clever detective, the faithful assistant and the sometimes gruff police captain serving as the foundation. It's a solid model, and Breckman spins the bottle just right to shake up the contents enough to give the illusion of presenting something new. This 16-episode second season set carries on in pretty much the same way the first did, with seriously obsessive-compulsive detective Adrian Monk (Tony Shalhoub) and nurse/assistant Sharona (Bitty Schram) going against the grain (and plenty of phobias) to solve some baffling crimes, with occasional involvement from Captain Stottlemeyer (Ted Levine) and his freshly scrubbed underling Lieutenant Disher (Jason Gray-Stanford). With its blend of smart comedy and traditional TV detective mystery, Breckman's creation of Monk finds itself on the proverbial slippery slope. Too much of a shift in either direction could spell disaster, and the writing managed to remain properly balanced, at least through the first two seasons. 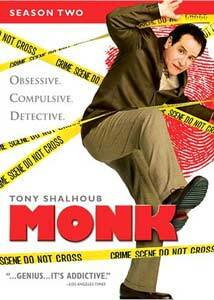 The episodes in season two remain fairly formulaic, but like Columbo, the real enjoyment in Monk is the way Shalhoub's portrayal of the brilliant detective connects the seemingly random dots in order to catch the bad guy, all in between bouts of OCD or some other nearly debilitating phobia. A few threads leftover from the first season, such as a few more clues about the mysterious murder of Monk's wife, come to the surface, but in general these are all standalone episodes involving an impossible-to-solve murder and Monk's innate ability to figure it all out. This second season also sports an interesting lineup of guest stars, including John Turturro (who shows up as Monk's brother in Mr. Monk and the Three Pies), Tim Curry (as longtime enemy Dale "The Whale" Bieberbeck in Mr. Monk Goes to Jail) and Amy Sedaris (as Sharona's accused-of-murder sister in Mr. Monk Goes to the Theater) making the supporting cast seem especially well rounded, without appearing like the writer's are performing one of those typical guest star stunts. One of the real high points is Turturro's appearance as Ambrose Monk (a man with some major clutter issues), and the episode also features quite a bit of revealing backstory on the Monk family that fleshes out and solidifies the main character just enough to cause us to look at him a little differently. Turturro and Shalhoub are excellent together, and Mr. Monk and the Three Pies is clearly one of the series' best-written episodes, for this season or any other. Sherlock Holmes model or not, the quirky television detective scenario has really been done to death over the years, In the case of Monk, that "been there, done that" hurdle was a big one, and I think it is Shalhoub that makes this show work as well as it does. This guy has proven himself to be an accomplished film actor (just look at his Oscar-worthy performance in The Man Who Wasn't There), and his obvious comfort level on the small screen turns what could have been just a cleverly written show into one that features a likeable but odd lead character that is comically overwrought and perfectly underplayed. Image Transfer Review: Universal is following the much appreciated trend of releasing television series sets in anamorphic widescreen with Monk: Season Two, which has been issued in a 1.78:1 aspect ratio. Overall image quality is an improvement over sometimes shoddy cable reception, but it was difficult to get past the fine grain that is so prevalent on nearly every episode. I would have expected a sharper, crisper image transfer, but colors look presentable amidst the grain. Audio Transfer Review: Audio is presented in Dolby Digital 2.0 surround, and despite being a fairly recent series, the sound quality is effective but remarkably ordinary. Dialogue is always clear, and considering this is a show built on characters talking (as opposed to big action and effects-driven set pieces) it is more than sufficient. Extras Review: The four-disc Monk: Season Two comes packaged in one of those five panel foldout cases inside of a cardboard sleeve. Each disc houses four episodes and one extremely short extra. Disc 1 contains The Minds Behind Monk (04m:35s), in which creator Andy Breckman and actor Tony Shalhoub talk about the origins of the character and the series, and the parallels between it and Sherlock Holmes. Disc 2 contains Disher Character Profile (03m:06s), where actor Jason Gray-Stanford discusses the hows and whys of his character, and Ted Levine does the same on Disc 3's Stottlemeyer Character Profile (04m:37s). Disc 4 has Precinct Tours with Jason Gray-Stanford (02m:13s), essentially a quick tour of the police station set, including where the actor hides his lines. Each 44-minute episode is cut into 4 chapters, with optional subtitles in English or Spanish. The show started to dramatically move in a different direction as the third season progressed, which makes this second season set one of the last chances to catch this show in what many consider its best form. With this series Tony Shalhoub proves on a regular basis that he is an underrated comic actor, and even if the whole OCD gag begins to wear a little thin at times, it is his portrayal that holds this all together.